With the buzz over as to who is the real winner in the Eat Drink Perth "Best Coffee " Competition, I felt there are many more cafe's in Perth that deserve a mention. I have always wondered about these competitions and think of them more as some form of popularity vote rather than really a reflection of the best coffee. To me, the best coffee is an subjective experience which hinges on the person's own experience and taste-buds favorites. If we all thought the same about one particular coffee than in my logic there would be only one type of cafe that serves one type of coffee, and the cues would be endless. But that not being the case I would have the draw the conclusion that maybe a lot of other factors come to play when one thinks of what great coffee is. I quite happily consider myself a little bit of a snob when it comes to coffee. I feel I have played long enough in the field (around 30 years, and not giving away my age) to have gained some knowledge on the subject, but have also developed my taste-buds in such a way that it can recognise a great coffee to one that is undrinkable and everything in between. I have owned and operated 2 cafe's and currently I am also an owner operator of another cafe where we roast our own coffee beans. If anyone ever has the inclination of wanted to own a cafe, begin by sourcing your beans. And if all possible; roast your own! However that is not always possible, so I guess the best next thing is to source it from a place where you know they roast their own coffee fresh everyday. So back to this competition thing. I looked at the winners and did an comparison with them on to check out what the ratings were on them. I assumed that there would be some correlations in regards to this, and I was a little surprised to find the winner of "The Eat Drink Perth coffee competition" was not actually rating as high as I would have expected. So that got me thinking. How are these competitions judged and who decides on what is best? 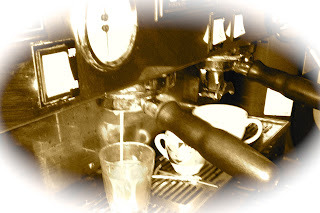 I felt with the snob that I am and the passion that I have for coffee, it is time for my personal crusade to discover who and what decides what great coffee is and who and what decides what cafe receives all the media coverage. Do I dare to think there would be some favoritism going on, are people paying other people to be reviewed and how come that everyone always talks about "Location Location" the most obscure tucked away in side streets little cafe's are the hub of busyness? They serve great coffee, have friendly staff and just get on with the business of serving great coffee. The philosophy of "Concentrate on what you well and do it with a passion" strikes a cord with the people. Because without all the advertisements or exposures to these great little cafe's, the greatest marketing tool of all continues to prevail and that is Us the people .... Word of Mouth. There are notes in Coffee? ?